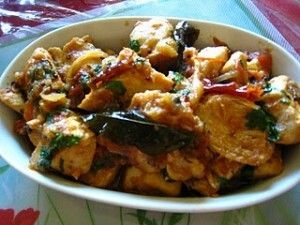 Sabat Masala Chicken recipe by Nazish Arslan at DesiRecipes.com. round dried chillies 1/3 cup. Dry fry them in fry pan till you can feel khushbu and grind but be carefull not to make a complete powder. Marinate chicken in yogurt, salt , garlic / ginger paste n rest of Sabat masala. Also add cooking oil . Set in fridge for 2 to 3 hours. Now put in a wok and cover with a lid for awhile till chicken turns tender. Now stir fry till golden and leaves oil. Garnish with green chillies n finely chopped corriander leaves.